It is almost time to start celebrating the magic and joy of the festive season, as Mr & Mrs Claus are all set to appear at this years Santa's Magical Kingdom 2014. 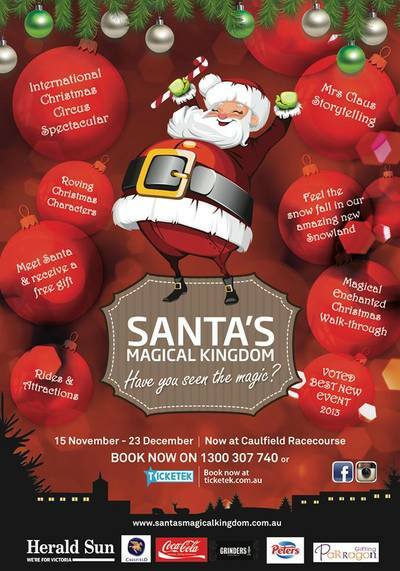 Opening on 15 November and running until 23 December, Caulfield Racecourse will be transformed into an enchanting Christmas wonderland, filled with family entertainment and attractions suitable for all ages. We here at Kid Town Melbourne HQ are very excited to announce a FAMILY PASS GIVEAWAY. We are offering one lucky reader the chance to win a family pass worth $130, covering entry for 2 adults and 2 children into Santa's Magical Kingdom. To enter, provide your name and details to: kidtownmelbourne@gmail.com. Remember to please include SANTA as the email subject. We will contact the winner by email on Saturday 8 November 2014.